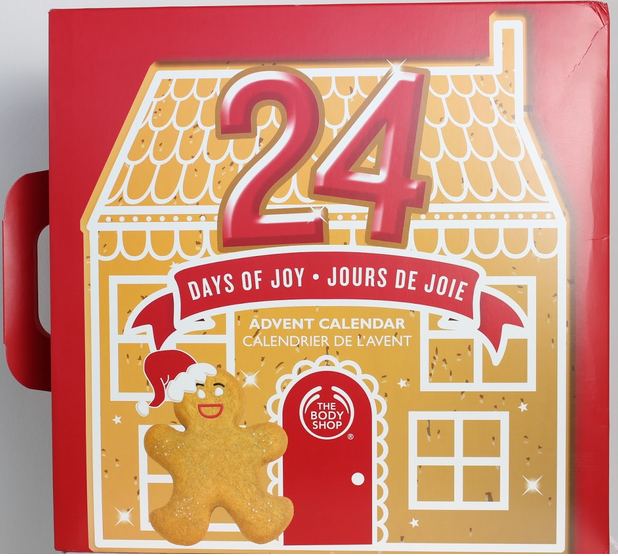 5'1 is the new 6'2: The Body Shop® Advent Calendar - 24 Days of Joy! I know I've been a bit AWOL from the Blogosphere - especially with the Christmas season upon us - I can't apologise more - so to make it up to you I'm back with a 7-Day-Combo-Review on my Body Shop® Advent Calendar! The Body Shop 24 Days of Joy is filled with The Body Shop best sellers and retails for £55. You'll receive 24 surprise products which have the retail value of £80! It ranges from mask and body creams to cheek stains and shower gel. I'd never had a beauty advent calendar before and after this lovely little surprise - I definitely will be! It's just so pretty and perfect to look at I never wanted to actually open it! From all the hype I've heard this is a fabulous shower gel - but I've just never enjoyed the Strawberry scent! Though; knowing The Body Shop, and the fact I gave it to a friend: it's gentle on skin and the scent lasted all day! This Strawberry scented item I do love! It moisturises and hydrates lips leaving a shine finish, without a sticky texture. It gives a red tint that means if I don't fancy a lipstick on I can apply this bad boy and I'm set for hours! Om Nom Nom - I'm never usually into spiced soaps, But this has been a joy to use, it really got me into the Christmas spirit; that and crave a Gingerbread Latte! This is another scent I underestimated - I'm never usually into white musk - my Mam loved it, me, not so much - but I can get enough of it! My skin feels amazing after using and the scent isn't a strong once absorbed into the skin - it's light and fresh. I'm quite skeptical about cheek/lip stains - I always have the constant fear of looking like a clown. But this was quite easy to apply and quite pretty for the Christmas season as I'm sure I can see a bit of sparkle in it. This I LOVE! I've had it before and I'll buy it again! I love the feeling of the whipped texture and the fact my skin feels soft, smooth and soo awake! I'd been dying to get my hands on this bad boy since getting the scrub! J'Adore this range! It's by far my favourite range in store. I can't get enough of this. It's lightly scented and does wonders on my lips! So that's days 1 to 7 and I've loved 90% - I've been certainly pleasantly surprised by the products and there will be many a repurchase in the new year - I can guarantee that! Did you get the The Body Shop® Advent Calendar - 24 Days of Joy? If so, what did you think? Have you tried any of the products? What're your thoughts on them? Watch out for the next lot! I want it all hahah! The body shop calendar looks great wish I got one now.